A mounting body of evidence finds that the spread of mobile technology is adding to news consumption, strengthening the appeal of traditional news brands and even boosting reading of long-form journalism. But the evidence also shows that technology companies are strengthening their grip on who profits, according to the 2012 State of the News Media report by Pew Research Center’s Project for Excellence in Journalism. The annual State of the News Media report is a comprehensive analysis of the health of journalism in America, which includes detailed analysis of eight different media sectors as well as an overview that identifies key trends and key findings of the essential statistics about news in the last year. This year’s study also includes special reports on the impact of mobile technology and social media on news. Those reports, which feature new survey data, finds that rather than replacing media consumption on digital devices, people who go mobile are getting news on all their devices. They also appear to be getting it more often, and reading for longer periods of time. For example, about a third, 34%, of desktop/laptop news consumers now also get news on a smartphone. 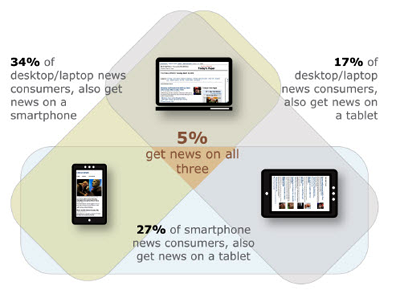 About a quarter, 27%, of smartphone news consumers also get news on a tablet. These digital news omnivores are also a large percentage of the smart phone/tablet population. And most of those individuals (78%) still get news on the desktop or laptop as well. A PEJ survey of more than 3,000 adults also finds that the reputation or brand of a news organization, a very traditional idea, is the most important factor in determining where consumers go for news, and that is even truer on mobile devices than on laptops or desktops. Indeed, despite the explosion in social media use through the likes of Facebook and Twitter, recommendations from friends are not a major factor yet in steering news consumption.